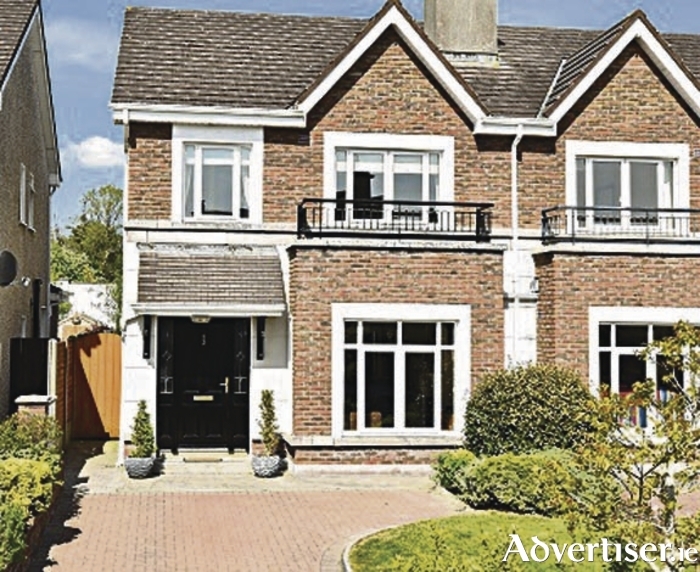 Keane Mahony Smith presents this beautiful extended family home in Caiseal Cam, Roscam. Presenting in excellent decorative order, No 32 offers the savvy purchaser the opportunity to acquire a lovely home with upgraded kitchen/dining room and children's den. Situated in the ever popular O’Malley-built Caiseal Cam estate only c7km from Galway city centre and c3km from Oranmore, the location is ideal for those working in the city centre and the major employment hubs east of the city (eg, Parkmore, Ballybrit, Ballybane industrial estates ). Amenities such as a park, playground, tennis courts, playing pitches, shops, and bus route are a short walk from the property. This home has a clean, crisp, style flowing through the property. A large family room with bay window shines light through the room and a feature fireplace frames a solid fuel stove insert providing excellent heat. The kitchen/dining area has been recently extended and renovated. This area is the focal point of the house. The truly beautiful kitchen offers excellent counter space and lots of cupboard space with a lovely place to dine. The modern gloss kitchen units, stainless steel sink unit, integrated appliances, breakfast bar, and feature stainless steel and glass extractor fan all add to the modern chic design. The dining area has beautiful French doors leading to the low maintenance paved and decked rear garden. The extension provides for a children's den area which is an excellent addition. It allows you to keep an eye on the little ones but still provides separation from the beautiful kitchen/ dining area. The den could also be utilised as a TV/ reading room. The utility room and a downstairs wc complete the ground floor accommodation. The first floor accommodation comprises beautiful master bedroom with built-in wardrobes/dresser unit and en suite, two well-proportioned bedrooms, and another bedroom currently in use as an office. The main bathroom has a bath with shower, wc, whb, and fully tiled floors and walls. This property has the benefit of upgraded insulation with pumped cavity walls, extra insulation in the attic, a closed fireplace (solid fuel stove insert ) in the family room, double glazed windows and gas fired central heating all add to the cosy family feel of this home. This is truly a must-see family home. Viewings are by appointment only with the sole selling agents Keane Mahony Smith on 091 563744.